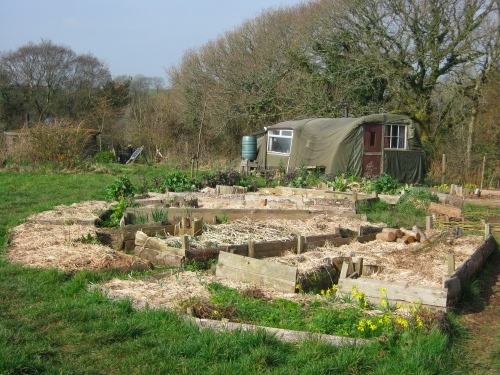 What do you expect from a community that describes itself as a permaculture project? If it’s a rural community with dozens of acres of farmland at its disposal you might think that surely food production would come pretty high up the list of priorities. But the Landmatters community in South Devon isn’t like that. I’ve been involved with Landmatters as teacher, advisor and visitor over the nine years it’s been going and I had the opportunity to visit it again last week. I was doing a couple of days’ teaching at Schumacher College, which is nearby, and we took the students to see Landmatters on one of the days. We were shown around by a couple of long-term volunteers, because our visit coincided with one of the few days on which the community members are unavailable. For one day each month they practice The Way of Council, a method of coming together so that each person can speak their mind and emotional issues can be dealt with. To my mind this is an essential element of any permaculture community. 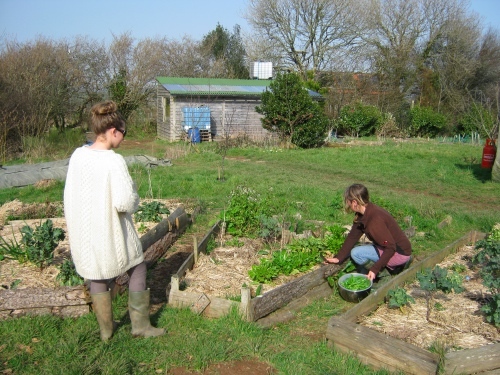 Of the three basic permaculture ethics – earthcare, peoplecare and fair shares – peoplecare is the one that so often goes by default. Of all the projects you’ve heard of that had problems or ended in failure, was it ever a physical problem that did for them? In my experience never. It’s always because the people fall out. We all have emotional needs, just as we need to eat and drink, and we if we don’t have any intentional way of meeting these needs they can rise up like a flood and swamp us all. The Way of Council is an essential part of what Landmatters are doing, which is mainly about learning how to live a low impact lifestyle. Our culture is very production-oriented. We assume a high level of consumption is the norm and then put a lot of effort into securing the resources to achieve that high level of consumption. That’s putting the cart before the horse. If we’re aiming towards a sustainable way of life in the future, the first thing we need to think of is how we can bring our level of consumption down to something closer to what the Earth can provide. We may think we could all do that if we wanted to or had to, but how many of us have actually done it? How many of us know from personal experience what it takes: the amount of physical work involved, the different levels of expectations? It’s something which we need to consciously learn, just as much as we need to learn about sustainable food production. They do produce food, of course. They grow vegetables and keep goats and poultry. There’s also a small business based in the community growing salads for sale in local markets. But what interested me much more was how little money they need to earn. In the lunch break we did have a chance to catch up with the community members and I discussed this with Richard Freeman, aka Brains, one of the founder members. He works in a wholefood shop just one day a week and also does some one-off jobs through the year which add a bit to his income. This means more time is available for other things. He and his partner, Maren, are educating their children at home and are building a wooden house adjoining the bender where they live at present. 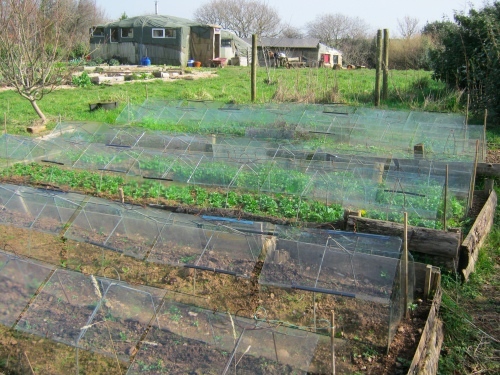 Early salads growing under cloches. Most of the timber for the house came from the community’s own woodland. 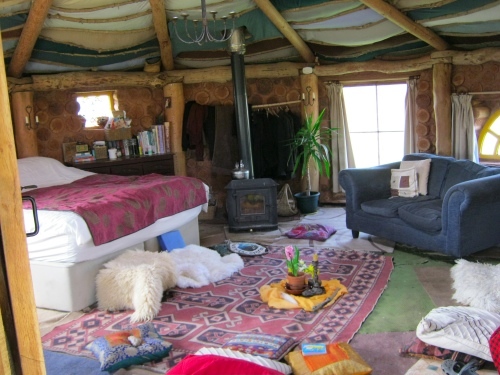 Another family have built a cob and cordwood roundhouse, also mainly from onsite materials. Home-grown wood provides the community with its fuel as well. Electricity is from solar panels and wind generators. The water supply is mainly rainwater collected from the roofs of the structures, especially the barn, while drinking water comes from a borehole fitted with a beautiful, low-effort hand pump. The barn is multi-purpose. 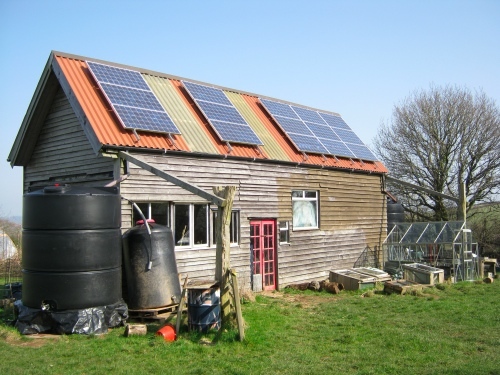 As well as being a workshop and a hay store it collects both rainwater and solar energy. The site is quite exposed to the wind, and windbreaks were always an important element of the design. The most important ones have been developed by allowing the existing hedgerows to grow up tall, doubling them up with a row of alder trees and adding some shrubs to give a thick bottom. One particularly telling thing I noted was the relative absence of mud. After a record-breaking wet winter, which had only ended a week before our visit, this was impressive. As someone who has lived outside myself I can attest what a huge difference mud can make, both to your efficiency in getting things done and to mental well being. The initial design of the settlement, especially the layout and positioning of the benders, takes much of the credit for the lack of mud. Another thing there’s not too much of is motor transport. At present there are four cars between eight families, which has increased from only two quite recently, I was told. This compares to the two per family that most people living in such an isolated place find indispensable. To me, this sums up the importance of Landmatters as an experiment in sustainable living: it’s not so much what they’re doing that is important, it’s what they’re not doing. For more pictures see our Facebook page.